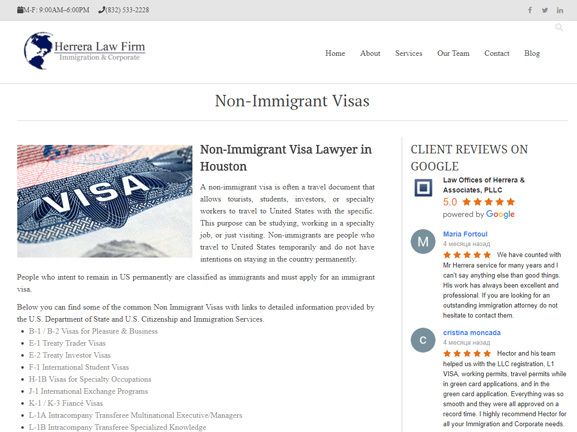 Herrera Firm is a full services law firm, focusing on immigration and business. This firm is bilingual in English and Spanish. Their firm has represented clients from many industries such as Oil & Gas, Education, Food, Retail, Manufacturing, Financial Services, and Information Technology. Herrera Firm’s attorneys have over 20 years of experience in immigration and business law. Mr. Herrera needed the new website design with a goal to express his company values and services. He was looking for a professional business website and responsive web design with search engine optimization. This internet marketing strategy would bring a significant increase in website traffic and bring new clients to the company. Herrera Firm wanted aStash to create and integrate a large volume of custom web content with links to official documents and at the same time have easy and clear navigation throughout the website. 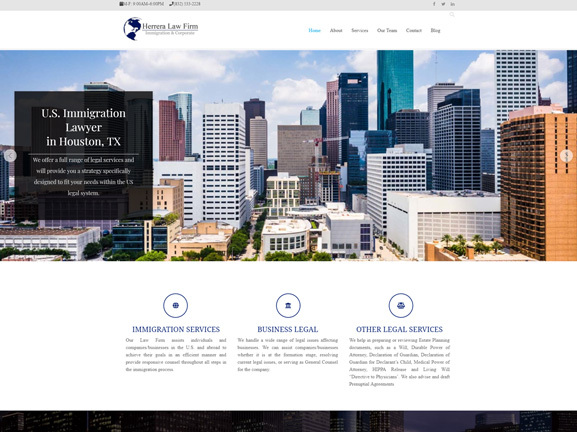 It was important to make the website content easy to read and have multiple “call to action” buttons so it is always a convenient option to contact the law firm. The other challenge was to create a fully bilingual (English and Spanish) website as most of Mr. Herrera’s clients are Spanish speaking. We used digital marketing strategies to help Mr. Herrera to reach his goals. Herrera Firm challenged aStash to build a new identity for his company and generate large amounts of both digital and print advertisements. Additionally, Mr. Herrera needed help with search engine optimization, pay-per-click and social media strategies. While working on Herrera Firm’s website, we focused on creating a professional web design with clearly expressed values of the company. We wanted to emphasize just how much experience, knowledge, and client trust Herrera Firm has. It was important to have a content-rich website so customers in need of legal services could access general information about what they needed. We created over 20 pages of new, engaging content. Because most clients are searching for services on their phones, we designed a fully responsive website with easy navigation and all information is readily available on every device. We made both English and Spanish versions of the website to ensure Spanish speaking clients understand the company’s values and services. Astash created 5+ versions of a new logo design and law firm business cards. We offered multiple brochure ads for the Spanish newspaper where the company already advertises and created multiple profiles across various social media channels. Astash added search engine optimization to the website which increased traffic by over 400% and resulted in increased sales. At aStash we provide Fort Collins web design & web development. We have experience and knowledge in online marketing for the legal industry and many others. Whether you need a custom web design, social media marketing or Fort Collins SEO services, we can help! See more about our Fort Collins web design services or check out our web design pricing.